Oracle Team USA transitions from training in Bermuda to racing in Oman this week with the start of the 2016 Louis Vuitton America’s Cup World Series season. 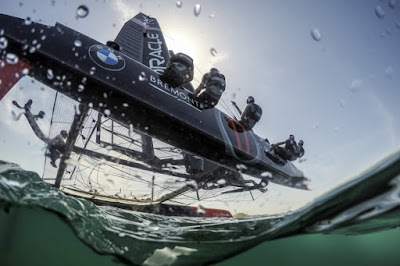 Three races featuring six teams will be held both Saturday and Sunday, February 27-28, on the Sea of Oman. “We shift into race mode this week. We’ve been really focused on our development program. But, the racing is what you look forward to. We’re fortunate to be able to do both and we’re really excited for this weekend in Oman,” said skipper Jimmy Spithill. OTUSA currently sits second in the overall Louis Vuitton America’s Cup World Series standings with 112 points, 10 points behind Emirates Team New Zealand, after three events last year. The focus this weekend is on improving. “Everyone here has the same gear, the same boats, the crews are all the same weight. So, it comes down to the best teams. With the format now in the World Series and the fact that you go into Sunday with three races for double points, it really means it’s not over until the last race. This will be a hard fight,” Spithill added. In addition to Spithill, the Oracle Team USA sailing crew for the Louis Vuitton America’s Cup World Series Oman includes Tom Slingsby, Kinley Fowler, Kyle Langford, Sam Newton and Matt Cassidy. Sailing in the Sultanate of Oman will be familiar territory for Fowler, who spent time training and racing in the region. Fowler was on the crew for the Portsmouth event in 2015 and now returns to the lineup. “It’s exciting to be back on the Louis Vuitton America’s Cup World Series team, We’ve been running through video and trying to get back into that mindset. In our gym, ‘Oscar’ [Craig McFarlane], our trainer, did a really good job with setting up a circuit for us before Oman. It has helped us get back into that really high heart rate, top handle, running across the net movement, and reorienting ourselves,” Fowler said. In addition preparing to race the AC45F again, Oracle Team USA will also be adjusting to the light wind conditions expected this weekend. “We’re looking forward to getting back out on the race course. It’s a challenging venue, and sailing in lighter conditions requires a lot more finesse, treading carefully and smooth movements.We just want to put in a good performance and sail as well as we can. I think if we do that, we’ll have a good result,” Tom Slingsby said. The Louis Vuitton America’s Cup World Series Oman marks the first time America’s Cup racing has come to the Middle East. Racing begins at 14:00 local on both Saturday and Sunday, with three races scheduled per day. The race course runs along the Al Mouj Golf Course in Muscat, along 2.5 km of unspoiled Arabian coastline.